Meet at: MPavillion, Queen Victoria Gardens, opposite the Arts Centre on St Kilda Road, Melbourne. The Squeaky Wheel are conducting two Design Rides this spring! They have teamed up with the creative folk at the Office for Good Design to bring you two rides exploring Melbourne’s creative side. The Office for Good Design’s mission is to advance excellence in the creative industries, support innovation and advocate the value of design, architecture and the arts. All things which tick boxes for us and there’s no better way to discover what creative Melburnians are doing than on a bike! See your city by bike through the eyes of its creative community. Join landscape architects Tract Consultants and The Squeaky Wheel for a free, well-paced tour of Melbourne’s botanical landscapes, real and imagined. 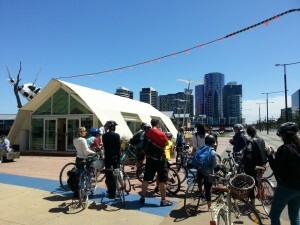 Pump up your tyres and cycle over to Queen Victoria Gardens – the afternoon ride begins and ends at MPavillion. This tour is appropriate for confident riders and will take place mainly on on-road bike lanes and city streets. Bring some water, sunscreen and snacks.